"Power to the people. Stick it to the man." Silicon Valley actor turned filmmaker Matt Ross takes to the wilderness for a family story about living off the grid and struggling to raise a family amidst the chaos of the modern world. 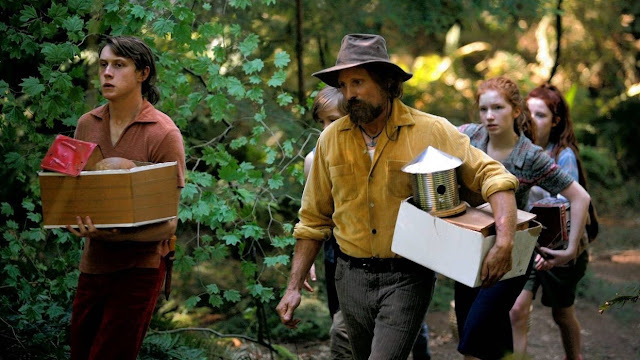 Viggo Mortensen does fine work in Captain Fantastic as the father and educator of a young brood of six kids as he struggles to cope with the death of his wife and justify his alternative lifestyle to the outside world. The cast of kids is exceptional with their own unique character traits (and names). George MacKay (Bodevan), Samantha Isler (Kielyr), Annalise Basso (Vespyr), Nicholas Hamilton (Rellian), Shree Crooks (Zaja), and Charlie Shotwell (Nai) feel like a real family with subtle relationship dynamics and bonds of their own while still working as a cohesive family unit. Ross crafts a unique take on ideas of universal family drama and the dangers of groupthink. Mortensen's Ben could easily be a troubling patriarch forcing his own ideals on his children yet his loving motivations and the amount of free thinking he allows counters most of those dangers. Captain Fantastic ultimately succeeds on the performances of its fine young cast anchored by Mortensen's strong, emotional work. Ross' direction and flair in how to express this ragtag family's story with his camera lifts what could easily be a limited premise about alternative lifestyles, family histories, and the state of American society or eduction. At its core, it's a film about struggling how to love and take care of the your family without harming them with your insecurities.